TORONTO — Ontario gamblers wagered $5.85 billion in fiscal 2004-05, an increase of $125 million from the previous year. However, after expenses were deducted, the province received only $1.7 billion in net income from gambling. The annual report of the Ontario Lottery and Gaming Corporation shows the bulk of the revenues -- $2.3 billion -- came from lottery tickets and bingo operations. Commercial casinos brought in $1.5 billion, while charity casinos and slot machines at provincial racetracks brought in $1.9 billion. The gaming corporation is promising to create new customer services centres in its commercial casinos this year that are staffed by problem gambling specialists. The province will spend $4 million over the next two years on public awareness campaigns about gambling addiction. Majority of Canadians Support Gambling Actual poll results are here. Last week, half a dozen federal and provincial officials met behind closed doors at Queen's Park with representatives of casinos and racetracks. The topic: the startling rise in illegal Internet gambling and what to do about it. Starting from scratch just a few years ago, Ontarians are now spending an estimated $300 million a year playing poker or betting on races from the comfort of their own homes via the Internet. "It's one of those issues that kind of creeps up on you a bit," says Gerry Phillips, minister of government services, who is responsible for the oversight of gambling in the province. It was Phillips who instigated last week's federal-provincial-industry meeting at Queen's Park with a March 6 letter to federal Justice Minister Vic Toews raising "some serious concerns" about the growth in Internet gambling. Internet gambling is strictly illegal in Canada. But because the gambling web sites are based offshore or, in some cases, on an Indian reserve in Quebec, it is tough for law enforcement authorities to get at them. Chicago Trainer Arrested For Using "Elephant Juice"
It seems to be a secret. I did a Google and Yahoo News search for "Fort Erie racetrack" and "Fort Erie race track," and I could only find one recent article mentioning it in the Hamilton Spectator on April 22. I did find out the the Bruce Willis movie Lucky Number Slevin was shot mainly in Montreal but the early race track scenes were filmed at Fort Erie's race track. Rulings written by the Ontario Racing Commission on April 11 and announced April 20 reveal that approximately 20 people have been fined for buying drugs/medications from an unlicensed vendor in Ontario. Bill Hicks of the Ontario Racing Commission (ORC) told The Horseman And Fair World that the rulings citing “conduct prejudicial to the best interest of racing” came as a result of an investigation separate from the one announced Thursday, April 20. The ORC released news Thursday that Aranesp and other drugs were discovered in a search and Sandy DiFlorio was arrested. The majority of those people found to have purchased drugs/medications through the unlicensed vendor, who Hicks said is Fred Rogers, were fined $1,000 and put on probation. One horseman, Robert Hummel, was fined $2,000 but has already appealed. Trainers had 10 days to appeal the ruling. Among those fined as a result of the investigation were Shane Arsenault, Charalambos Christoforou, Carl Jamieson, Scott McEneny and Don Rankin. COLUMBUS, Ohio – As reported by the Cincinnati Enquirer: "Cincinnati would no longer get slot machines under a revised statewide ballot issue. "The latest proposed constitutional amendment, delivered to Attorney General Jim Petro's office Monday, calls for slot machines at Ohio's seven horse-racing tracks - including River Downs in Anderson Township and Lebanon Raceway in Warren County. It also proposes slot parlors at two Cleveland sites. Each location could operate up to 3,500 slot machines. "The plan no longer includes a Cincinnati slot parlor within three miles of Fountain Square, as was proposed in the March 24 ballot initiative by the Learn and Earn Committee…"
Ohio to randomly test for "milk shakes." Steve Stavro, who bred and raced such stars as Canadian Horses of the Year Benburb and Thornfield, died April 24 of an apparent heart attack. He was 78. Stavro was voted a Sovereign Award as both outstanding breeder and owner of 1992. It was the year Benburg was Horse of the Year and champion 3-year-old male after winning the classic Prince of Wales Stakes (Can-IR) and defeating United States star A.P. Indy while winning the Molson Export Million Stakes (gr. II). The following year, Stavro's filly Apelia was champion sprinter. Thornfield and another champion, Saoirse, came later. Thornfield was 1999 Horse of the Year and best grass male after winning the Canadian International Stakes (Can-IT). Saoirse was top older female in 2000. A native of Macedonia, Stavro came to Canada as a a youngster and worked in his father grocery store. He later opened his own grocery store and started the Knob Hill Farms grocery chain. He also was a part owner of the Toronto Maple Leafs and a governor of the National Hockey League. Stavro bred and raced his horses in the name Knob Hill Stable. He campaigned such other important winners as Debra's Victory, Granacus, Megas Vukefalos, Schossberg, and Zadracarta. Granacus and Schossberg were grade I winners south of the border. Granacus won the 1988 Blue Grass Stakes (gr. (I) at Keeneland, and Schossberg captured the Jerome (gr. I) and Philip H. Iselin (gr. I) Handicaps. Stavro also was big soccer fan and is a member of the Canadian Soccer Hall of Fame. 12 year old horse wins stake race. Finger Lakes lack of entries causes two dates to be cut. Fort Erie Casino revenues up slightly for the first quarter from the same period last year. It was the first increase in quite some time. Apr 19 A confirmed case of strangles at a Peterborough, Ontario area farm has resulted in racing restrictions for a number of racing stables. The highly contagious disease was confirmed yesterday at Fairway Farm (formerly Kawartha Farms) which has resulted in a voluntary quarantine of the training property. As a result a number of trainers have been affected including Murray Samons, Shaun McDonald, Ted Reid, Laurie Horton/Wayne Ferguson, Ray Allen, Steve Gassien/Monica Hendricks, Per Henriksen, Owen Renout, Howie Murney/Wayne Kilner, Milt La Riviere, Doug George, Matt Element, Don/Wayne Campbell and Mark Baker. An estimated 30 horses (not all racehorses) have been affected by the outbreak. A quarantine period of 21 days will apply to horses on the property and 14 days for horses that had recently left the property. Strangles is a highly contagious disease caused by the Streptococcus equi organism. Typically, the disease begins as a throat infection before the organism makes its way to the lymph nodes of the body via the lymphatic system. Treatment tends to be to allow the disease to run its course and treat with penicillin in severe cases. The Ontario Racing Commission - Investigative Unit, working with other police and regulatory services, has taken a supplier of drugs to the horse racing industry out of business. On Tuesday the 18th of April 2006, authorities converged on a residence in the City of Toronto and on a Steel Company in Mississauga to execute two Search Warrants for illegal drugs, under the Controlled Drugs and Substances Act and the Food and Drugs Act. The combined forces included members of the ORC Investigative Unit, the Ontario Provincial Police Illegal Gambling Unit, the United States Food and Drug Administration, Standardbred Investigations Services and the Toronto Police. This is related to drug scandal at the Meadowlands. The Ontario Racing Commission advises all Ontario racing industry licensees that severe penalties will be imposed on anyone found to have acquired, is in possession of or administered the drug Aranesp to a horse. The ORC regulates a number of different testing programs to ensure the fair and safe operation of racing in Ontario, including the Erythropeietin (commonly known as EPO) Antibody Testing Program. While originally developed to treat people suffering from anemia associated with chronic renal failure, Aranesp (darbepoetin alfa) is classed as a potent long-lasting form of EPO. EPO triggers the horse’s body to produce more red blood cells and is thought to improve performance by increasing the blood’s oxygen carrying capacity. However, regulators around the world have been working to eliminate the use of the drug because of its potential effects on performance and its detrimental impact on the animal. Such control measures are essential in order to maintain the health and well being of the horse and the integrity of the industry and the public confidence. Albertan Cecil Peacock is living the dream of every thoroughbred owner in the world - to own a horse that will run in the Kentucky Derby. Money generated by Hollywood Slots in Bangor has increased four straight months and the increases are growing larger. The total gross for March was almost $46 million, up $7 million from February and $17.2 million more than November, the opening month. The total net revenue for five months is more than $12 million of which $367,744 goes to Maine harness racing purses. SASKATCHEWAN – As reported by the Regina Leader-Post: "The First Nations-run Swift Current Casino was one step closer to becoming a reality Tuesday with the signing of a municipal services agreement between the city and Nekaneet First Nation. "'The signing of the Municipal Services Agreement between the city and Nekaneet First Nation is both historic and significant,' said File Hills Qu'Appelle Tribal Council (FHQTC) chair Dean Bellegarde. "…The tribal council has been responsible for the negotiation of four separate agreements in order for the property to be created as an urban reserve. The Nekaneet First Nation will host the site of the new $22.7-million casino and performing arts centre. "…The Saskatchewan Indian Gaming Authority has been operating casinos in the province for the past 10 years. The Swift Current Casino will be the sixth Indian-owned and-operated facility in the province…"
NEW YORK – As reported by the Buffalo Business First: "The Seneca Nation of Indians has begun a public-relations campaign in support of its planned Buffalo casino. "After weeks of being battered by lawsuits, politicians and business leaders, the Seneca Gaming Corp., which oversees the casino gaming operations for the Indian tribe, has started running a series of radio and TV ads that advocate plans for its proposed Seneca Buffalo Creek Casino in downtown Buffalo. "The ads tout the economic impact of the 100,000-square-foot casino, slated for a nine-acre parcel along South Park Avenue. The ads point out the project represents a $125 million investment and will create more than 1,000 jobs…"
awarding of a Digital Surveillance System contract at Casino Windsor. April 20,2006 for a bail hearing. interest as he is employed in a senior capacity at Casino Windsor. : daily handle up 13% over last year. Western Fair announcer Frank Salive's voice appears in the horse racing segments of the new movie Lucky Number Slevin with Bruce Willis and Lucy Liu. Catalogue is available on-line here. Despite fewer racing dates during the first quarter of 2006 compared with the same period last year, pari-mutuel handle on races in the United States and Canada increased 3.73% to $3,590,607,272, according to the Thoroughbred Racing Economic Indicators released on Friday by the National Thoroughbred Racing Association and Equibase Co. The overall increase in the handle figures coincided with a 1.33% increase in aggregate purses to $199,641,227 compared with $197,021,571 in the first quarter of 2005. The number of race days dropped 1.79% to 1,154 from 1,175. "The first-quarter handle and purses statistics are very solid, especially in light of the quarter's drop in racing dates," NTRA Commissioner D.G. Van Clief Jr. said. "It was also a quarter that saw an unraced two-year-old sell at auction for a record $16-million, so there are a number of reasons to feel encouraged as we head into the spring and summer months." 'When Der Ali won Saturday's first race at Santa Anita, his $2 show payoff of $139.20 shattered a record that had stood for 68 years. Playmay paid the former record of $104.60 on Feb. 4, 1938. The show payoff on Der Ali, a 28-1 shot, was inflated when 1-5 favorite Denied finished fourth in the field of six after attracting 94.7% of the money wagered to show. The total show pool of $176,163 included $166,832 placed on the odds-on favorite. The winner paid 59.40 to win, 139.20 to show. The place horse paid 42.20 to show, and the third place horse paid 60.20 to show. Denied finished fourth over 15 lengths behind the third place finisher, at 20 cents to the dollar. Today Santa Anita has a Pick Six Carryover of over $1 million. Too bad Canada doesn't have a common pool with California yet, or they might attract more bettors. The lawmakers sure are taking their time getting California and Florida common pooled, too bad, they might be able to introduce some online poker players if they sped things up. County Executive Joel A. Giambra announced that the county will join lawsuits seeking to block the casino. Buffalo Sabres owner Tom Golisano announced that he is against the Buffalo casino. Mayor Byron Brown is also reevaluating his decision. Senecas want Buffalo location to prevent others from opening up in Buffalo? PEI casino on hold....Wagering up in Charlottetown. 'A U.S. firm that advises institutional investors is recommending Magna Entertainment Corp. shareholders withhold their support for incumbent directors including chairman Frank Stronach because of the company's dismal performance. The Seneca Gaming Corp. confirms in documents filed with the Securities and Exchange Commission that its emerging Buffalo casino will cater primarily to Buffalo and its suburbs, raising worries that it will drain assets already here without pulling significant outside dollars into the local economy. "We believe that Seneca Buffalo Creek Casino will provide tangible economic benefits to the community, most notably in the share of slot revenues," responded Seneca Gaming spokesman Phil Pantano. "It is a $125 million investment in an area that hasn't seen that kind of investment in some time, if ever." Meanwhile, he said the casino could retake some of the $60 million to $80 million a year that leaves the Buffalo area to be wagered at the Fort Erie race track. "These findings show the gaming industry has been a significant contributor to the New Jersey economy, and will continue to be so, assuming current levels of taxation and regulation," Weinert said. The Casino Association of New Jersey comprises representatives from nine Atlantic City casinos: The Hilton Casino Resort, The Borgata, Bally's, Caesars, Harrah's, Resorts, Sands Casino Hotel, Showboat and Tropicana. Trump Entertainment's three casinos are not part of the group. I don't think the author really understands that much. He doesn't interpret the numbers right, but at least the numbers are in this article. Hollywood Themed Casino Planned for Penn National. Azdeck looks good in the 2nd race today. Look out for longshot possibility Redclouds at Night in the 7th. In the 9th, the exactor of Well Timed and Forest Light might be worth taking a shot on. Toronto-based TrackPower Inc. announced Thursday that Tioga Downs Racetrack obtained a $20 million bridge loan from RCG Longview II on March 30. TORONTO, April 6 /CNW Telbec/ - Baymount Incorporated ("Baymount") (TSX Venture: BYM - News) is pleased to announce that two of its independent Directors, Gordon Ashworth and Helmut Biemann, exercised options to acquire 600,000 common shares and 100,000 common shares respectively, at an exercise price of $0.175 per share. The gross proceeds of the transaction are $122,500. he Massachusetts House of Representatives voted April 5 to defeat a proposal adding 8,000 slot machines to the state's four racetracks, one of which is Suffolk Downs, the historic Thoroughbred facility in East Boston. By vote of 110-55, the House killed a bill that met approval in the Senate (26-9) last fall. Any measure of the kind was facing a veto stamp from likely 2008 presidential candidate Gov. Mitt Romney if it were to gain passage in both bodies. 'As Congress continues to haggle over the scope and objective of the proposed Internet Gambling Prohibition Act, the racing industry again finds itself in disagreement with the Department of Justice over whether interstate simulcasts are legal under the federal law. Officials for the Justice Department have argued over the past six years that interstate wagering on horse races is illegal, but the department has never acknowledged an investigation into the horse racing industry's practices. Ohr also said during his remarks that the Justice Department is concerned about the potential for fraud, money laundering, and the involvement of organized crime in Internet wagering, citing specifically a recent indictment of 17 individuals for operating an illegal gambling ring that bet $200 million on horse races over four years through five rebate shops. A U.S. shareholder has complained that Great Canadian Gaming Corp., Canada's largest casino operator, issued stock at steeply discounted prices to chief executive officer Ross McLeod. In a letter to the Toronto Stock Exchange, Highfields Capital Management said the proposed sale of units in a recent private placement amounted to what it said is "one of the most extraordinary transfers of wealth to a public company insider that we have ever seen." Boston-based Highfields Capital is referring to Great Canadian's recent move to avoid a breach of its debt covenants by raising $80-million in a private equity placement that included a $50-million contribution from Mr. McLeod. Under the terms of the placement, Great Canadian said last week it was going to sell 6.2 million units comprising one share and one warrant for $12.89 each. Of that amount, 3.8 million units went to Mr. McLeod, who made the purchase through a newly formed corporation. "We believe that this self-dealing transaction is being undertaken in violation of TSX rules regarding pricing and authorization of private placements and may raise questions regarding TSX rules on related party transactions," Highfields said the letter to the TSX. PLATTSBURGH -- An amendment introduced in the Senate would require the Department of Homeland Security to create a free day pass for U.S. citizens to cross the Canadian border and return within 24 hours without a passport. The legislation, co-sponsored by U.S. Sen. Charles Schumer, would amend the Securing America's Borders Act. One section of that act calls for the use of biometric data, secure cross-border documents and other security enhancements. "Nothing is more important than securing our borders. But, we must also protect cross-border commerce and tourism," Schumer said in a press release. "This day pass would allow for spontaneous travel, so people in western and northern New York can continue to take advantage of services, shops and work on the other side of the border." The passport requirement stems from the Western Hemisphere Travel Initiative, proposed by the U.S. departments of State and Homeland Security. Slated to take effect on Jan. 1, 2008, it would require passports or other department-approved documentation, such as NEXUS, SENTRI and FAST, for all travelers to and from the Americas, the Caribbean and Bermuda, including U.S. citizens. One alternative document being discussed is being called the PASS card. As proposed, it would still cost almost $50 and take a similar amount of time to obtain -- four to six weeks -- as a passport, the press release stated. The Senate amendment would allow children under the age of 18 to travel to Canada and return without a passport if accompanied by a parent or guardian. Schumer said the amendment would allow school groups and families with large numbers of children to continue crossing the border for educational or recreational purposes without spending the money for passports. In addition, the amendment mandates that any passport-alternative border-crossing documents cost no more than $20. Applications for the day pass would be filled out at any U.S. Port of Entry along the U.S.-Canadian border. The applicant would be required to certify there was not enough time to apply for a passport before the trip. The amendment was sponsored by Sen. Byron Dorgan (D-N.D.) and co-sponsored by Schumer (D-N.Y.), Sen. Olympia Snowe (R-Maine), Sen. Conrad Burns (R-Mont.) and Sen. Jim Jeffords (I-Vt.), all representing border states. Immigration law might affect horse racing in US. Magna loses $51 million land sale, at least for now. VANCOUVER, British Columbia – As reported by the Canadian Press: "Gateway Casinos Income Fund (TSX:GCI.UN) has signed a deal to buy a hotel and casino in suburban Vancouver for $106.3 million in cash and units. "The Vancouver-based casino fund said Monday it will buy the Cascades Langley Casino and Hotel for $32.6 million in cash and 4.7 million units of the fund. "Gateway also said it planned to increase its monthly distribution to unitholders by 0.45 cents per unit to 11.95 cents per unit per month after the deal closes. "…The fund said the cash portion of the deal would be funded by a $35-million offering of 5.35 per cent extendible convertible debentures. "…The casino, which opened in May 2005, includes 530 slot machines, 24 table games and an eight-table poker room as well as a 420-seat theatre. The hotel and convention centre has 77 rooms and a 25,000-square-foot convention centre…"
ONE WINNER LAST NIGHT FOR WOODBINES PICK 7: $383,154.90 PAYOFF. Candadian Horse Racing Marketing Workshop starts today. The New Jersey State Police has announced further details about a raid on the Seldon Ledford Stable and other locations, and the arrest of driver Eric Ledford and several other persons this past Friday, in connection with the execution of one dozen search warrants. The Police, in a news release, said that unspecified quantities of drugs, including EPO (Erythropoietin), were seized during the search of the home of Ryan and Ardena Dailey, employees of trainer Seldon Ledford. Aranesp, a potent, long-lasting form of Erythropoietin (EPO) and other schedule II and III narcotics were among the items seized. EPO helps red blood cells carry more oxygen to the muscles. Aranesp, the release said, does not produce antibodies in the horse’s bloodstream, and is said to be undetectable with current post-race antibody tests. The use of all forms of EPO is currently banned in horseracing. The Police also froze the assets of a veterinarian John R. Witmer, 68, of Freehold, N.J., who was among those arrested on Friday and charged with conspiracy to rig a publicly exhibited contest. Witmer’s bank accounts and assets, the release said, were valued at approximately $1 million, and the value of pharmaceutical items seized from Witmer was estimated to be in excess of $150,000. Chris McErlean, vice president of racing operations at the Meadowlands, was quoted as saying “the Meadowlands is extremely concerned with the integrity of our races and the entire horse racing industry. The expectation of fairness in our racing and its results is our lifeblood. “The New Jersey racetracks and horsemen pay over $2.7 million per year to the New Jersey Racing Commission to conduct drug testing, the Meadowlands is the largest contributor to a private investigative arm that works in the Standardbred industry (Standardbred Investigative Services), and we have been a leading proponent of detention barns -- requiring horses to be in a secured barn area, supervised by the Meadowlands, 24 hours prior to a race. The carryover for Woodbine's Pick 7 wager sits at $274,699.82 heading into the Tuesday, April 4 programme at the Toronto oval. On Monday evening, bettors who correctly selected six of the seven winners from races three through nine were rewarded with a $1,484.55 payoff, but no one swept the wager, which could approach $500,000 on Tuesday. A total of $161,387 was bet into the Pick 7 pool on Monday. In race 2, Everblazing should have an easy time of it. In the 6th race, the exactor of Abounding Truth and Search the Church has a good shot of coming in. In the 9th race Fleet Storm should hit the board fresh off a second in Tampa Bay. Blood Doping, Improve Times by 2 seconds? One blogger brought up Sheldon Ledford's unually high winning percentage back in early February suspecting something was fishy. 'The State Police's horse racing squad leveled charges yesterday that something more sinister was behind the rise: illegal blood doping that improved the horses' times by two seconds or more. State troopers arrested Ledford's son, Eric, a top driver at the Meadowlands who won the famed Hambletonian in 2002. Eric Ledford was arrested in the drivers' room at the Meadowlands before last night's races, Detective Sgt. William Shurts said. Earlier in the day, State Police arrested a veterinarian and a trainer who work for Ledford, along with the trainer's wife, on charges they rigged races by giving horses endurance-enhancing drugs that made them run faster. No charges have been filed against Seldon Ledford although the investigation is continuing, said Lt. John Zulawski, who is in charge of the horse racing squad. Troopers seized significant quantities of the banned drug Aranesp from the homes of veterinarian John Witmer and trainer Ryan Dailey, said state Deputy Attorney General Christine D'Elia. She said they also confiscated suspicious liquids and syringes from Showplace Farms in Englishtown, where Ledford Racing rents stable space. ***I'm suspect of any trainer who wins over 22% of his races in either harness or thoroughbred racing. Whenever money is involved, there is always someone out to beat the system. 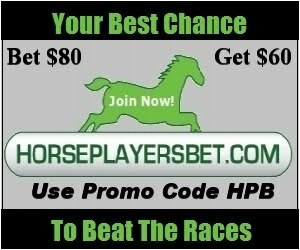 Race horses have a universal birthdate of January 1st, for horseplayers it is April Ist. 'Originally scheduled to launch last summer but delayed while Woodbine fine-tuned its wireless network, the new technology was approved by the Canadian Pari-Mutuel Agency late last year. The ORC has hired a new Thoroughbred steward in Fenton Platts, who was Woodbine's paddock judge last year. Platts, brother of Canadian Horse Racing Hall of Fame jockey Robin Platts, replaces Ivan McHutchion, who retired last fall. Harold Fortune, the head valet in the jockeys' room and the backup paddock judge at Fort Erie, replaces Platts as paddock judge. I'm A Kipper might just upset in Race 1. Easy exactor in the 9th: Judiths Wild Rush and Danieltown. It won't pay much though. And Carabineer should win the finale. TRENTON, N.J. -- Horses trained by the Meadowlands Racetrack's leading trainer were ordered scratched from all races this weekend after state police executed three search warrants at a farm in Monmouth County on Friday. The New Jersey Racing Commission ordered the scratches based on "investigative activities" at trainer Seldon Ledford's stable at Showplace Farms in Englishtown. The directive affects 12 horses scheduled to race in various races at the East Rutherford oval on Friday, Saturday and Sunday. Ledford leads all trainers at the Meadowlands with 48 wins during the current meet. Sgt. Stephen Jones, a state police spokesman, confirmed search warrants were executed at the barn on Friday morning as part of an ongoing investigation, but he declined to discuss why they were sought or what, if anything, was seized at the site. There is no published phone listing for Ledford and he could not be reached for comment Friday night.